In most neighborhoods in Seoul, it’s easy to spot signs and posters advertising “massage shops.” Varying in type and pricing, these massage parlors cater primarily to office workers who work desk jobs and are looking for ways to unwind their stiff or aching bodies. Though most are independently owned, a number of franchise massage brands, such as Body & Foot and The Foot Shop, have grown in popularity for their widespread accessibility and affordability. At these shops, a standard full-body massage costs around 50,000 won ($45), far below the price tags of massages at high-end spas. As with any wellness routine, the effects of a massage are subjective. Moreover, the experience can vary depending on the skills of the therapist and the state of the recipient. Some South Koreans are big massage fans, while others are less enthusiastic. 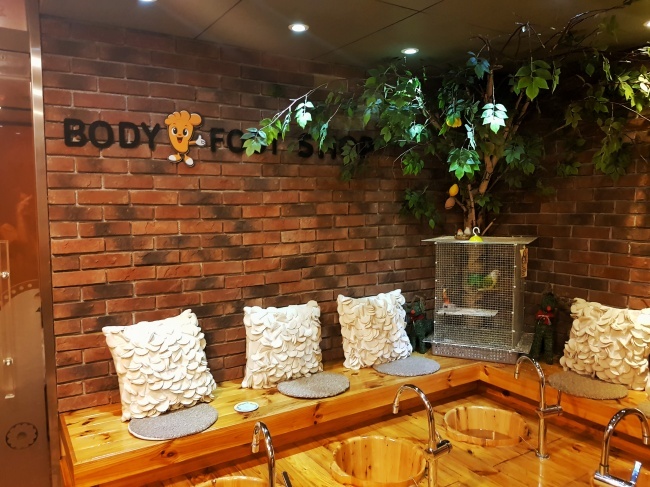 As someone who falls in the latter group, I recently received the “most standard” massage in Korea at a Body & Foot branch near my office in central Seoul, in hopes of producing a brief review and guide for those who are new to -- or are afraid to try -- massages. Having set up an appointment via phone earlier in the day, I arrived at the massage shop on a weekday afternoon. A manager at the front desk explained the different options, ranging from pain therapies and sports massages to aroma massage therapies and foot massages of varying durations. Overwhelmed by the choices, I went for the most popular option: the 80-minute sports full-body massage that covers the neck, shoulders, back and lower body, and includes a stretching session and abdominal massage. The package usually costs 75,000 won, but with membership and cash discounts, the price fell to 55,000 won. A couple of minutes after I changed clothes and soaked my feet in warm water while enjoying a cup of tea, a masseur in uniform came out to greet me, directing me to a massage bed in a dimmed room with soothing music. I spend most of my day typing and slouched over a laptop, with bad posture, and also carry around a heavy backpack. Due to my work habits, I have chronic shoulder and neck pain. I also do not exercise, aside from walking during my daily commute to and from work. Based on my descriptions and his own diagnosis, the masseur concentrated on relieving my “pain points” -- my upper shoulders, which he called “severely cramped.” The routine was quite painful at first, causing me to tense up rather than relax, but the process became more bearable over the course of the massage -- a sign that the muscles were easing. The question of whether massages only create a placebo effect or bring actual therapeutic benefits continues to be debated among scientists. But research shows that massages can improve your health, whether it is easing muscle soreness or reducing stress levels. The main way in which massage relieves muscle pain is through myofascial release -- a manual therapy technique used in massage as well as chiropractic manipulation. According to the US-based Mayo Clinic, a therapist locates myofascial areas that feel stiff and fixed instead of elastic and movable under light manual pressure. These areas, though not always near what feels like the source of pain, are thought to restrict muscle and joint movements, contributing to muscle pain. By applying focused manual pressure to and stretching the problematic muscle, myofascial release therapy loosens up the muscle’s restricted movement, leading indirectly to reduced pain, the clinic notes. Back at the shop, although marked by moments of awkwardness -- such as when I faced upward and had inadvertent eye contact with the masseur -- the massage grew on me, and it began to feel therapeutic. The 80-minute session wrapped up with a series of stretching poses to loosen up the muscles in my back, shoulders and legs, with the assistance of the masseur. Before leaving, I was told that I might feel slightly faint or even experience potential muscle spasms later as my muscles were “interrupted” in the process of the massage. “It’s not just all relaxation. A massage is an athletic workout for the person receiving it as well,” my therapist said. Aside from some immediate fatigue, I left the massage parlor feeling slightly more refreshed. I’m still not sure whether the 80-minute session was enough to warrant significant improvements in health. Nonetheless, it was better than not getting one, especially at this price and no-frills convenience.